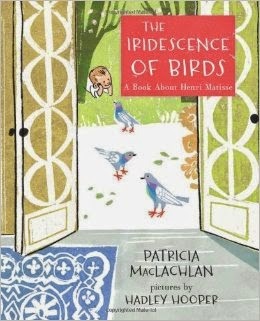 The Iridescence of Birds is an informational picture book biography that is breathtaking from cover to cover. Author Patricia MacLachlan (Sarah, Plain and Tall is still one of my all-time favorite Newbery winners. I can still remember where I was when I read it) and artist Hadley Hooper (Here Comes the Girl Scouts by Shana Corey) combined talents have produced a beautiful book that pays homage to the creative spirit of Henri Matisse. In just a few sentences MacLachlan asks readers to imagine what might have influenced Matisse's love of color. Was it the bright colors his mother used to paint the plates that hung on the wall with meadow scenes? Or the woven red rugs she put on the floor and walls of their cottage that was located in a grey mill town in Northern France. Maybe it was the fruit he arranged into bowls or the fresh flowers in the vase. On creating the illustrations for this book, Hadley says in her artist’s note, she thought about Matisse and his work before going to sleep and upon rising in the morning. I decided to try relief printing, which forced me to simplify my shapes an allow me to focus on the color and composition. Combining old and new technology, Hadley used stiff foam and cardboard to cut out the characters, then inked them, made prints, and scanned those prints into Photoshop. Perfect! 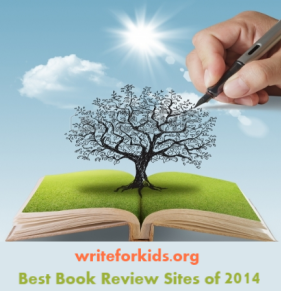 Please share this book with people of all ages, from babies to senior citizens. It will fit perfectly when talking about artists or the creative mind. And before I end this review, I want to acknowledge their editor, Neal Porter. Mr. Porter is amazing and has demonstrated again and again his remarkable skill of discovering talent and/or giving them the encouragement and belief in their abilities that allows them to go above and beyond to create really great picture books. Thank you, Neal Porter. Go here to see pictures from the book.